"With the System on the verge of complete annihilation and new factions of freethinkers emerging, Vee knows she must find a way to end the Commander’s rule quickly—and by any means necessary. When the Union arrives in New England, it’s to discover their rebellion has already reached this part of the country. Food stores are low, medical supplies are nonexistent, and without the coal from nearby Mines, the residents are on the verge of freezing to death. Guilt-ridden because of the role she played in the region’s downfall, and refusing to be the cause of anymore suffering, Vee is coerced into working with a group of brilliant scientists who hope to form an independent government below the ruins of New York City. But when she’s asked to assassinate an opposing leader, Vee has no choice but to reevaluate her own morality and examine just how far she’ll really go to see victory in the war against The Tax." Plot: Ten months after taking down the Southwest system, Vee and the Union have only one mission: to free every child and put an end to the slavery system instituted by the Commander. After months of defying the order, Vee, Oliver and Cason find themselves in the North, New England. 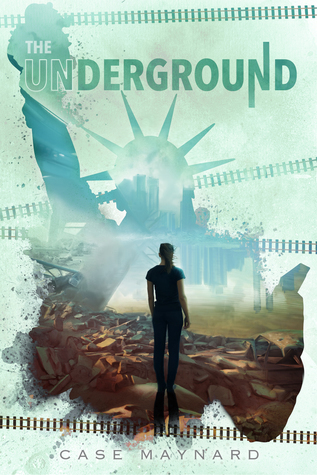 Captured by the inhabitants of Subterranea, the Union discovers their quest for freedom has left the people in New England with little to no means to survive. Already haunted by Ramsey's death, Vee doesn't want anyone else to die due to her actions and embarks on her most dangerous mission yet: Vee must work undercover to put an end to one more Master. "It's eerie to travel through this smoky city and see no inhabitants. Almost as through people have been erased." Once again, the plot was very intriguing. It didn't disappoint as most second books in a series usually do - in a matter of fact, I think I enjoyed the plot of The Underground a lot more than I enjoyed the plot of The Surrendered. As in the previous novel, Case Maynard's writing style is flawless and it catches one's attention. There are still a lot of twists and surprises -however, I must confess, I did see one of the twists coming. Characters: In The Underground new characters are introduced -as well as a whole new world. I don't want to spoil anyone, but there was this one character that always gave off bad vibes and I was so happy that at the end I was right. It's really difficult to trust anyone in Maynard's world. Vee still is the girl who speaks her mind and goes to no end to free the children in the Mills. However, she is haunted by the events from the first novel. She has nightmares with Ramsey's death and blames herself for the death of John William and Miss Ann -deaths Matt does not let her forget. After the ordeals she went through, Vee was left with emotional scars and I'm really glad they were dealt with -I'm not fond of characters that go through traumatic experiences and show no signs of going through them. Vee became aware of how much her rash decisions affected the life of the people around her and tried to be more careful -she tried to think before acting (bravo for the character development). Talking about rash decisions... Xiang, the master Vee and her crew had to assassinate, was a hothead. He simply jumped to conclusions without taking a moment to think through it all. Vee never knew what to expect of him. Worldbuiling: As mentioned before, Maynard crafted a new world, the Subterranea. An underground community led by Percy, the Subterranea is trying to become independent from the Commander. However, although it was more technological evolved, I found this community a little bit similar to the Southies in their beliefs -they too wanted the children to keep working under a slavery system than set them free. They had no interest in putting an end to the Tax.